Butyl rubber (IIR), the chemical name of which is Isobutylene-isoprene copolymer is actually the copolymer of isobutylene and a small amount of isoprene. This rubber was first commercialized in 1943. For most applications, butyl rubber must be compounded and vulcanized to yield useful, durable end use products. This is same for all other rubbers as well. Grades of Butyl are developed to meet specific processing and property needs, and hence a range of molecular weights, unsaturation, and cure rates are available commercially. Both the end use properties and the processing equipment are important in determining the right grade of Butyl to be used in a specific application. The selection and ratios of the proper fillers, stabilizers, processing aids and curatives play vital roles in both how the compound will process and how the end product will behave. These Rubber consists of isobutene with a minor part of isoprene. The isoprene helps the rubber to unsaturate and possible to vulcanize. Generally for all rubber types, the gas permeability increases with increased temperature but for butyl rubber it is very low, up to 160-175 F.
It has an unusually broad loss peak. It displays high damping at ambient temperatures. 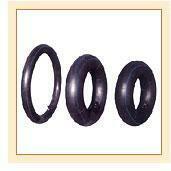 This rubber also has good weathering, heat, and chemical resistance. It has good impermeability and stability. It is not suitable for use in contact with mineral oils. Butyl rubber (IIR) is used when low gas permeation is needed. All products which are used to prevent gases from passing through the material are based on butyl rubber. Since this rubber has very high impermeability to gases, it is widely used for the inner tubes of pneumatic tyres, and also in vacuum and high pressure applications. IIR is considered to be good material for pharmaceutical stoppers, construction sealants, hoses, and mechanical goods as well. According to a recent estimate, the total annual demand for Butyl Polymers is around 650,000 Metric Tons. The development of halogenated butyl rubber (halobutyl) in the 1950s -60s helped in extending the usefulness of butyl by providing much higher curing rates and enabling co-vulcanization with other rubbers such as natural rubber and styrene-butadiene rubber (SBR). These properties led to the development of more durable tubeless tires with the air retaining innerliner chemically bonded to the body of the tire. Tire innerliners are by far the largest application for IIR today. Butyl Rubber and its primary derivative, halobutyl will continue to be a high value polymer specially well suited for its primary application of air retention in tires. Its unique combination of properties make it a preferred material for this application. As miles driven, tire size, and market sensitivity to pressure retention are all increasing, the demand for butyl rubber will continue to grow.